You may not realise it, but your post contains incredibly valuable information for scammers, fraudsters and other types of criminals – all committing crimes connected to identity theft. Every letter you receive contains important information about you, not just your name and address. Some letters contain vital information about you as well, such as your bank account details, driving licence number or National Insurance number. When criminals get their hands on this information, it’s easy for them to commit identity theft. Armed with your personal details, they can open bank accounts in your name, and also get mobile phones and credit cards by pretending to be you. That’s why protecting your post is so important – keeping your personal details out of the hands of identity theft fraudsters, who will stop at nothing to scam you. The first you may hear about it is when a bogus passport is given out in your name, or when someone you have never heard of rents a flat or purchases a car - and the bills start coming to you. Use a shredder - being aware of what you can bin – and what you can’t – is the first step. Make sure you never put sensitive information in the bin, including envelopes with your name and address on it, bank receipts, credit card information etc. All important information should be shredded – a shredder can cost as little as £10, and is a more than a worthwhile investment. 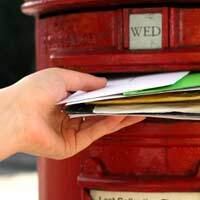 Don’t give others access to your post - making sure that fraudsters can’t get their hands on your post is vital. If you live in a flat and the post is sorted communally, you might want to have a private post-box that is lockable. When you go away on holiday, ensure that a reliable friend or neighbour brings your post in for you, and don’t allow it to lie unattended. Be careful when you move - if you move house, make sure you get your post professionally redirected by the post office. Tell other important organisations, such as your bank and credit card issuer, that you are moving and make them aware of your new address. Get rid of all paper bank and other statements - why leave bank statements sitting in your post box for identity theft fraudsters to make use of? Making use of electronic banking is definitely the way forward when it comes to cutting the risk of identity theft - and it’s better for the planet as well. Keep an eye on your bills - if they do not arrive on schedule, there might be a reason why. Check to make sure nothing untoward is going on. Steamline the post you get - there’s no reason to get lots of correspondence if much of it is junk mail. Get off direct marketing lists and only get post that is intended for you. The fewer letters you get, the less a chance that your identity will be stolen through the post. Often, postal identity theft reoccurs because the opportunity presents itself – again and again. If you keep your eyes open, your reduce the risk of being an identity theft victim. In one well-publicised U.S. case, thieves impersonating United States postal workers were caught picking letters out of postboxes. The only reason their scam didn’t work was because a canny resident noticed her post was being “delivered” twice – and reported the crime. Another common scam involves unsuspecting people being sent pre-approved lines of credit – for small children and babies. If your two-year-old has not applied for a credit card, be suspicious. Children are at very high risk for identity theft, so make sure you report anything that doesn’t look right. Remember, your post says a lot about you – and in the wrong hands a letter addressed to you could become a treasure trove of information for a criminal, leading all the way to your bank account – and beyond. Even unsolicited offers of credit from credit card companies – especially pre-approved lines of credit – can be potentially dangerous. Identity thieves have lots of tricks up their sleeves, from buying a mobile phone in your name to filing for bankruptcy in your name, buying a car in your name, and getting a passport by pretending to be you. You can avoid some types of identity theft by protecting your post, which means not allowing it to lie unattended – even in the bin - and shredding any pertinent information about you before it gets in possession of a fraudster. Q & A: What is RFID? I have also read this article and I agree with it. I have read this article and I agree with it. My purse was stolen with all my cards including my N.I. card. Where can i report this being stolen? Re: What is Identity Theft Fraud Alert?